The study, published in The Lancet journal, also says the extra years are spent with less serious disability. Data from more than 30 developed countries shows that since 1950 the probability of surviving past 80 years of age has doubled for both sexes. One expert said healthy behaviours for all ages was the key to enjoying living a long life. Professor Kaare Christensen, of the Danish Ageing Research Centre at the University of Southern Denmark, who led the study, said life expectancy had been increasing since 1840 and there was no sign of this trend slowing down. He said: "The linear increase in record life expectancy for more than 165 years does not suggest a looming limit to human lifespan. "If life expectancy were approaching a limit, some deceleration of progress would probably occur." In 1950 the probability of surviving for between 80 and 90 years of age was, on average, 15 to 16% for women and 12% for men. In 2002, these figures had risen to 37% for women and 25% for men. The study points out that until the 1920s, improvements in infant and childhood survival contributed most to the increase in life expectancies. Since then the increases have been fuelled by progress in the survival of the elderly, which has been particularly evident since the 1970s. The researchers said that man could now be regarded as having four stages of life - child, adult, young old age and old old age. They said there was no evidence that the old old age group were unhealthier than their younger counterparts, partly because the frailest people died first, leaving the most robust to survive past 85. 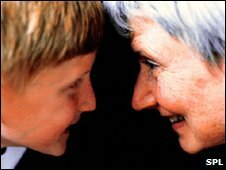 Danish research had shown that as many as 30% to 40% of individuals were independent from the ages of 92 to 100. And a study of US super-centenarians (age 110 to 119 years) showed that, even at these advanced ages, 40% needed little assistance or were independent. Professor Christensen said that in the UK and other countries there was evidence of a postponement in the limitations and disabilities caused by ill-health, despite an increase in chronic diseases. This was because of improvements in the diagnosis and treatment of illnesses such as heart disease and cancer. He said: "Increasing numbers of people at old and very old ages will pose major challenges for health-care systems. "Present evidence, however, suggests that people are not only living longer than they did previously, but also they are living longer, with less disability and fewer functional limitations." Some researchers have suggested that growing rates of obesity will limit lifespan - but Professor Christensen said such predictions were too simplistic. He said: "Life is a lottery and some obese people will live to a 100 and some thin people will die early. " Professor Alan Maryon-Davis, president of the Faculty of Public Health, said there were still concerns that obesity and unhealthy behaviours would shorten many people's lives. He said: "It's great that as a nation we're living longer and staying younger - but let's do what we can to help those who find it harder to lead healthy lives." A spokesman said it would look at the study's findings. "We know that the shape of our society is changing... We want to make sure that people who are living longer continue to enjoy a good quality of life. By 2040 we expect 1.7m more adults will have a care need. "We want to be able to offer really good care to everyone who needs it, so we need to radically change the way the system is funded."